Would you think I was kidding if I told you this is one of my husband’s favorite dinners. We don’t just have it around Thanksgiving, I make it all year round. It is that delicious and requires very little effort. I serve it with my Make Ahead Turkey Gravy and we absolutely love it. I think we all know roasting a whole turkey in the oven to perfection can be a daunting task. While the white meat on top overcooks, the dense dark meat under the bird comes to a safe-to-eat temperature. It can be a futile effort. During the rest of the year or if you are having a smaller crowd for Thanksgiving, turkey breast is the way to go. I make this exact same recipe with either a whole (6-8 pound) turkey breast or a half-breast (3-4 pounds). The only thing that changes are the cooking times; about an hour longer for the larger breast. Speaking of cooking times, the best way to roast turkey to perfection is with a meat thermometer. Do not rely on those pop-up timers. They are set to “pop up” at 180-185 degrees, about 15 degrees too high, which overcooks the white meat. Investing in a meat thermometer will change your cooking. I use the kind that keeps temperature while cooking and has a wireless device to alert me no matter where I am in the house. This turkey comes out of the oven so juicy and flavorful, it’s almost fool-proof. If you are a turkey rookie, this is a great recipe to learn with. And what to do with those turkey leftovers? I have lots of turkey leftover recipes here. The first step to a tender and juicy turkey breast is through brining. This is a simple way to enhance flavor and moisture in roasted meat. This does not have to take long…two hours tops. Most of the flavor is absorbed in the first two hours anyway. 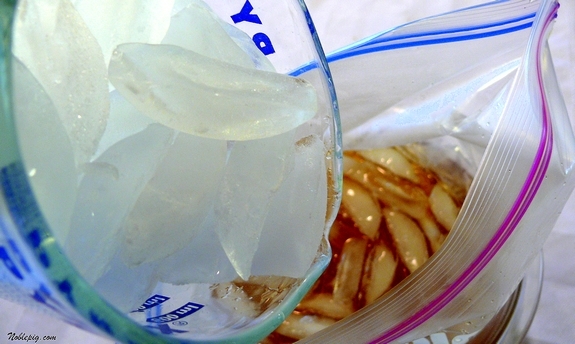 Dissolve salt and brown sugar in hot water in a 2-gallon resealable plastic bag. Stir in apple juice and ice. Make sure the brine is chilled thoroughly before adding the meat to prevent bacteria. Trim away the ribs and wing bone as well as any excess skin around the breast. Submerge the breast into the cold brine and let sit 2 hours. Roast turkey breast side up on a rack sprayed with cooking spray over a shallow roasting pan. (Cover the roasting pan in foil to make clean up very easy.) Using a rack elevates the meat, allowing hot air to circulate easily around the breast. Using a shallow pan roasts the meat where as a high-sided pan inhibits air flow and ends up steaming the meat. Not good. Preheat oven to 375 degrees and roast turkey in the upper third of the oven to get the best color. If making a 6-8 pound breast, after one hour, baste breast with maple-butter mixture. Baste every 15 minutes until the temperature of the breast reaches 165 degrees. If you are making a 3-4 pound half-breast, start basting a half-hour after cooking and continue basting every 15 minutes until the temperature of the breast reaches 165 degrees. Make sure to insert your meat probe into the thickest part of the breast. I like to insert it at the thinnest end, going towards the thickest. The basting itself provides flavor but because the breast is in the oven for a short period of time we need to hasten the browning process. The sugar in the maple syrup will promote browning and impart a nice, sweet taste. 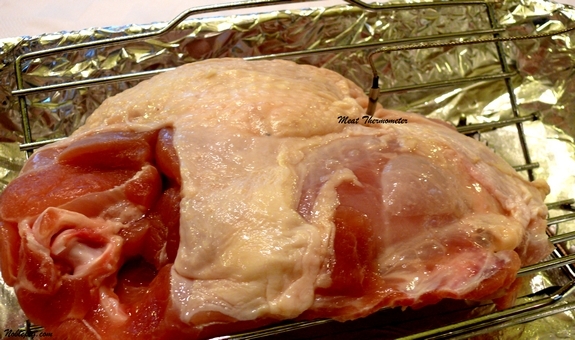 After the breast has reached 165 degrees, remove from the oven and tent with foil for 15 minutes before serving. 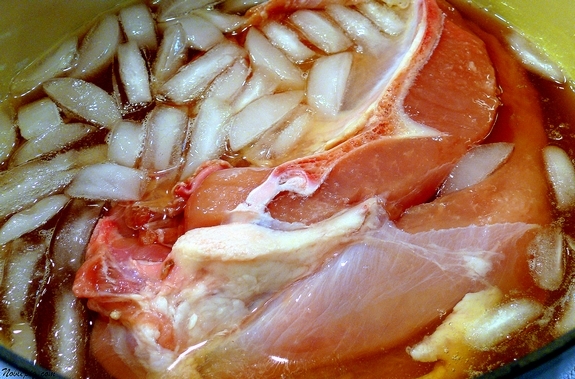 The first step to a tender and juicy turkey breast is through brining. This is a simple way to enhance flavor and moisture in roasted meat. This does not have to take long...two hours tops. Most of the flavor is absorbed in the first two hours anyway. Cooking Note: Once I was out of maple syrup while roasting and I used Mrs. Butterworth's. Guess what? It turned out perfect. I am printing this up. I am so hungry for more turkey . We are cooking up 2 this Thursday for all our company and I can’t wait!This recipe is a ‘must try for’ sure. It is easy to see why this woukd be a favourite!!! What a delicious sounding glazed turkey, and I appreciate all the tips throughout! I have to look for that timer on amamzon..
I’m thinking about sending my daughter home with the leftover turkey. This would be great to make for me and hubs later! This sounds so good and not something I would have ever thought of. I’ll have to give a try some time soon. I am doing a breast this year and never thought to brine it. Will work on that! The color on that turkey breast is gorgeous. I’ve already made the stock for your Make Ahead Turkey Gravy. Wow, that’s the way to go with one of the messiest jobs on turkey day. Your little jars of chutney are beautiful. The turkey even looks fork tender and juicy, yet perfectly browned on the outside. It seems like the perfect way to roast a turkey breast, or even a whole turkey. Thanks for this cooking tip. We eat turkey year round also. However, my husband loves to smoke turkey and we usually have a couple of those a year. What a great idea to brine the breast, it never occured to me! And Mrs. Butterworth, LOL. 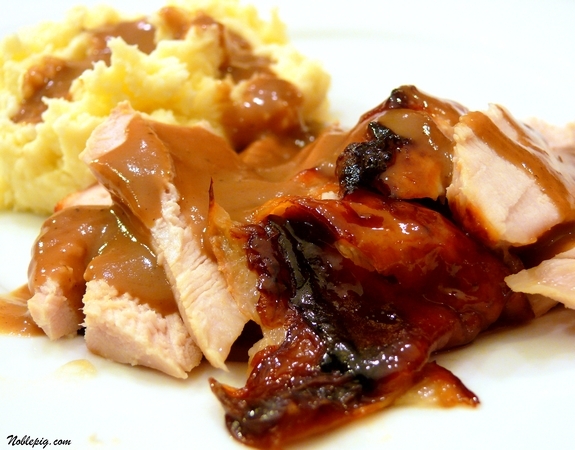 Maple syrup on a turkey breast…that sounds like it would make one fantastic tasting gravy. Wow – this looks so good, and I bet that brine would be great for pork too. You have no idea how excited I was to see this recipe this a.m.!! It’s like you read my mind. My husband really wants to deep fry the turkey this year, but I’m nervous and want to roast a breast as a back up, but I couldn’t find a recipe on line that I liked. This is just what I needed. Thank you. P.S. We had thanksgiving part 1 on Sunday and my sister made your upside apple pie – it was delicious! thank you again! I never would have thought to brine the breast because that’s what we’ve been using as a whole Turkey at this point, would just be overkill for us. I am DEFINITELY going to try that! Turkey has never been big in these parts. The idea of roasting a huge bird…not fun. It’s a nice option to just do the breast only though! Your recipes are amazing! I will be making this brine for our turkey – it’s about a 9#er. Have never brined before – but this looks too excellent to pass up! We’re also lovers of all things maple! Have a wonderful Thanksgiving, and thank you for your awesome blog! I think turkey is my favorite meat. I wish I hadn’t just been coerced into buying an 18 pound turkey for the three of us!!! I have two turkey breasts in the freezer. I will definitely try this. I keep saying I want to try brining-I just need to do it! Congrats on your published recipe! This looks amazing! I’ve been wanting to try something new and this sounds perfect. ahhh, another great way to use maple syrup! thanks! 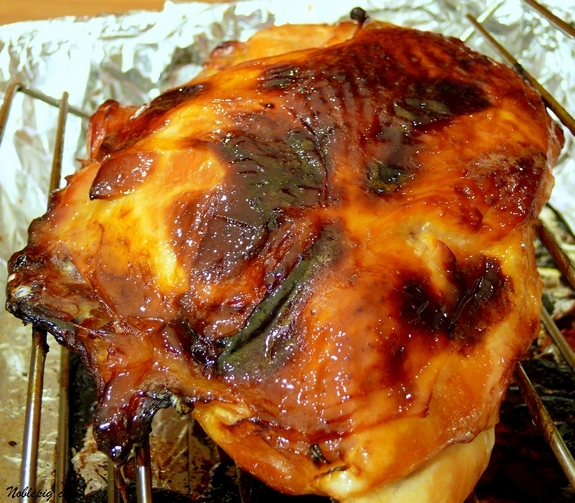 Maple syrup glazed turkey breast sounds wonderful! I’m planning to do a similar brine for my turkey, with apple cider. I’d want this year round too – it looks wonderful. I love maple anything! my interest is automatically piqued when i see the word maple, and i think the brine combined with the glaze would make this the most delicious bird ever. i’m serious about that. I really need a meat thermometer! I wireless one sounds perfect. This looks delicious! I’ll definitely make this between Turkey Day and Christmas. wow that looks darn good! love the charred bits and the glaze! Oh my God I never want turkey but boy I want that! how many does 6-8 pound breast meat and 3-4 pound breast meat feed? Always assume about a pound per person. I have never cooked a turkey – BUT – I am going to this weekend! Sound so good I have to try it! I tried this recipe on Thanksgiving, and man it was good. I don’t know where you get your recipes from, or if you make them up yourself, but everything I’ve tried making based on the recipes you’ve posted has been terrific. My family is begging me to make turkey again for Christmas. Seriously, this is some really, really good stuff. this is my first year making a turkey for thanksgiving. I want to use this recipe but was wondering if this recipe is suitable for a 12 lb turkey or how I would need to alter the recipe to suit a turkey that size. This is just for a turkey breast so cooking times and method will be different. I made this for Thanksgiving and my family loved it! They said the meat was tender and tasting like it was candied. I made gravy out of the drippings with great success.